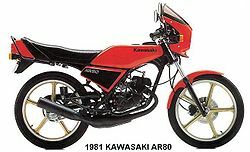 The Kawasaki AR80 was an 80cc 2-stroke street motorcycle manufactured by Kawasaki from 1980 through 1981. It was the slightly larger brother of the Kawasaki AR50 and had a mini fairing, uni-trak rear suspension, front disc brake, rear drum brake, and cast wheels. Seems to be the cousin of AR-80K but released in other countries. Some AR-80K are modified to give the rider a better speed and performance. This page was last edited on 25 October 2010, at 17:34.